Booth aesthetics can make or break your show. There are actually two components to your booth (other than your product of course!) your booth design and you! Many of the larger art shows will make information about previous years’ attendance available, including the median income of the attendees and the previous year’s sales. If that information is available, use it. I have known people who went to a glossy, glittery, women’s show and used old bed sheets as their table cloths. Their displays were cluttered and amateurish. Their booth appearance was impacted further because the bed sheets weren‘t even ironed. Needless to say, the show was a disaster for them. If people do not want to go into your booth, you will not have good sales. Your goal should be to create a pleasing, inviting booth, with a good traffic pattern, and enough room for people to move safely between displays. I never make an aisle in a booth less than 3 feet wide, and 3 1/2 or four is better. People generally don’t like to feel cramped and there needs to be enough room for people to circulate in the booth. 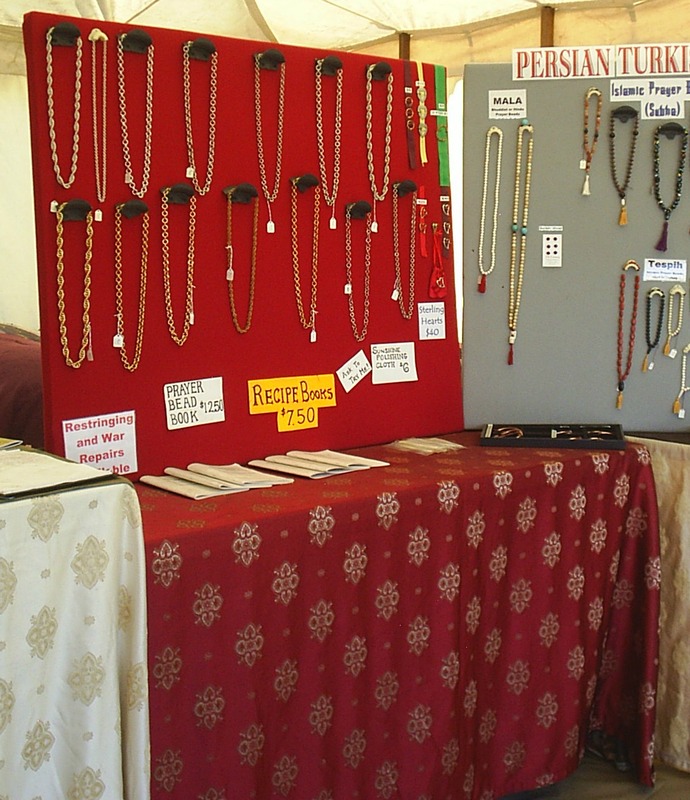 Even if you do sell knickknacks, you don’t want your booth to look like a garage sale! Be aware of how lighting makes your product look – ambient lighting can be enhanced with task lighting. Is it too bright? If so, colors may “wash out”? Are there dark corners where product tends to be ignored? Light it up if it’s too dark! You probably have table cloths, or other colored displays; consider how the color of the table cloths and/or displays makes your product look. I always try to set up my booth layout beforehand. You can take this to what some might consider an extreme and do a run-through of where everything goes. After years of doing this, I have several standard layouts that I can use. I actually have “maps” of how the booth is laid out. This is MUST if you employ booth labor! It makes setup go much more quickly if you know exactly where your tables and other display items go, and you do not need to move them around. Don’t underestimate the value of having a written plan when “things” are going wrong. This is part of my booth layout for one of the Medieval events that I do. The table cloth designs were chosen to give a Medieval feel to the booth. Do you dress for failure? I recently saw a picture of a friend that was taken at an outdoor event. To be blunt, she looked very unprofessional and sloppy. Casual is OK, as long as it suits the environment. I know that there have been times when the temperature was up around 100 degrees and I was soaked to the skin. But my hair was still combed and you could see that I had made an effort to dress nicely to start with. People are generally very forgiving of the affects of extreme weather. If you are in a building it is particularly important to look good. Choose your clothes based on the theme of what you sell, or the theme of the event. If the event is Western for instance, showing up in a coat and tails is going to be just plain weird. It is OK to look “artsy” if you are an artist, but generally the burned out hippie artist look is not a good idea. Consider your clientele and ask yourself “If I belonged to that social group, would I want to buy from someone who looked like me?” Your goal should be to make your potential customer feel comfortable with you, as a person and an artist, so that they will want to buy from you. I hope that this blog gives you many helpful hints that you can use to either design a new booth, or improve and existing one. This entry was posted in Jewelry, Vending at Events and tagged art show booth design, craft show booth design, Trade show displays by Eirny. Bookmark the permalink.